Which route is the best prospect for that rainy commute to work? Should we postpone our road trip to the mountains this weekend because of the snow? States participating in the road weather management — weather-savvy roads effort in Every Day Counts round four (EDC-4) can help motorists make those decisions. Road weather management can also help transportation departments deploy snowplows more efficiently and freight companies avoid hazardous wind conditions for truck drivers. “Road weather management provides the information people need to make better decisions on when to travel, how fast to drive, and what routes to take,” said Paul Pisano, leader of the Federal Highway Administration Road Weather and Work Zone Management Team. Twenty-two percent of all vehicle crashes in the past decade were weather-related. On average, these crashes resulted in nearly 6,000 deaths and more than 445,000 injuries a year. About 25 percent of nonrecurring traffic delays are due to adverse weather, and weather-related delays add about $3.4 billion a year to freight costs. Preventing crashes with winter maintenance approaches using anti-icing materials such as salt and sand affects watersheds, air quality, and infrastructure. In 2017 and 2018, FHWA is encouraging deployment of two strategies that enable State and local agencies to proactively manage the surface transportation system ahead of and during adverse weather events: Pathfinder and integrated mobile observations. “Agencies can choose one or both of these solutions,” Pisano said. Pathfinder is a collaborative process involving the National Weather Service, transportation departments, and private sector weather service providers to disseminate road weather information to travelers that is clear, concise, consistent, and impact-based. “The ultimate goal is to make drivers well-informed and able to make safe and efficient travel decisions during weather events,” said Roemer Alfelor of FHWA’s Road Weather and Work Zone Management Team. Utah is one of several States already using the Pathfinder process to deliver messages about weather events such as snow, freezing rain, and high winds. 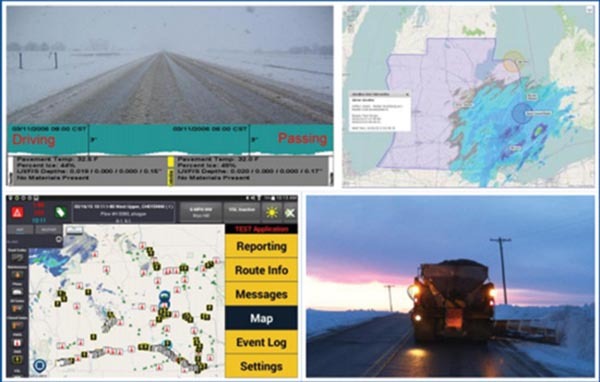 Pathfinder and integrated mobile observations help drivers make better decisions before and during hazardous weather. A Utah study of snow events showed a 40 percent reduction in vehicle miles traveled, indicating that concise, consistent messaging works. “The goal of integrating mobile observations is to deploy advanced, vehicle-based technologies to collect, transmit, and use weather, road condition, and related vehicle data for improved transportation system management,” said Gabriel Guevara of FHWA’s Road Weather and Work Zone Management Team. The data collected can be used for a number of road weather management strategies, such as winter maintenance decision support systems that enable agencies to use the right amount of labor, material, and equipment to pretreat roads. “Ultimately, integrating mobile observations can help DOTs improve efficiency in terms of costs, effectiveness in terms of results, and accountability in terms of measurement,” Guevara said. One agency using integrated mobile observations is the Michigan Department of Transportation (MDOT), which equipped 15 vehicles and 310 snowplows to collect camera images of road conditions and data such as air and surface temperature, relative humidity, and brake status. The data help maintenance workers use resources more efficiently. They’re also used to post motorist advisories on the MDOT Mi Drive Web site, a mobile application, and changeable message boards. View an EDC-4 webinar on weather-savvy roads. See Collaboration Across the Road Weather Enterprise: The Pathfinder Project for guidance on implementing the Pathfinder process and State DOT examples. See FHWA’s Road Weather Management Web site for information, training, and upcoming events. Contact Paul Pisano of the FHWA Office of Operations or Ray Murphy of the FHWA Resource Center for information and technical assistance. The Federal Highway Administration is mounting a concerted drive to promote the deployment of automated traffic signal performance measures (ATSPMs) at State and local levels across the country. As promoted through Every Day Counts round four (EDC-4), ATSPMs enable transportation agencies to incorporate objectives and performance-based approaches in traffic signal operations, maintenance, design, and management. Using ATSPMs can improve safety and customer service while cutting congestion and costs. More than 330,000 traffic signals operate in the United States. Typically, highway agencies retime signals on a 3- to 5-year cycle at a cost of about $4,500 per intersection. For most signals, citizen complaints are the primary performance measure. The absence of data drives retiming costs up by requiring the use of surrogates such as software modeling to simulate performance, along with expensive manually collected traffic data. ATSPMs are the outcome of technologies that provide data collection, analysis, and reporting capability to support an objective and performance-based approach to managing, operating, and maintaining traffic signals. The measures can be mapped to specific operations, management, maintenance, and design objectives. ATSPMs are generated by a high-resolution data logger incorporated into standard traffic signal equipment. The data are collected automatically and are accessible through a software platform that helps the user visualize and summarize the information. Automated traffic signal performance measures improve on traditional signal retiming processes by providing continuous performance monitoring capability. The Utah Department of Transportation (UDOT) is one of about 26 State and local transportation agencies already implementing ATSPMs, which are also being promoted through the American Association of State Highway and Transportation Officials Innovation Initiative. To date, UDOT has deployed ATSPMs at 1,750 of the State’s 2,000 traffic signals. “We partnered with Purdue University, the Indiana Department of Transportation, and equipment vendors to make this work,” said Mackey. Show real-time and historical functionality at signalized intersections. Increase safety by reducing the traffic congestion that results from poor and outdated signal timing. Provide the actionable information needed to deliver high-quality service to motorists, with significant cost savings to agencies by responding to issues faster, more efficiently, and more accurately. Provide active monitoring of signalized intersection performance that lets agencies address problems before they become complaints. Agencies have a number of implementation options to fit a range of capabilities and resources. UDOT developed software —available at no cost on the FHWA Open Source Application Development Portal—to take advantage of a high-resolution data collection capability. In addition, a number of vendors have integrated this capability into cloud-based software and traffic signal control systems that can be purchased as turnkey systems to provide ATSPMs. View an EDC-4 webinar on ATSPMs. 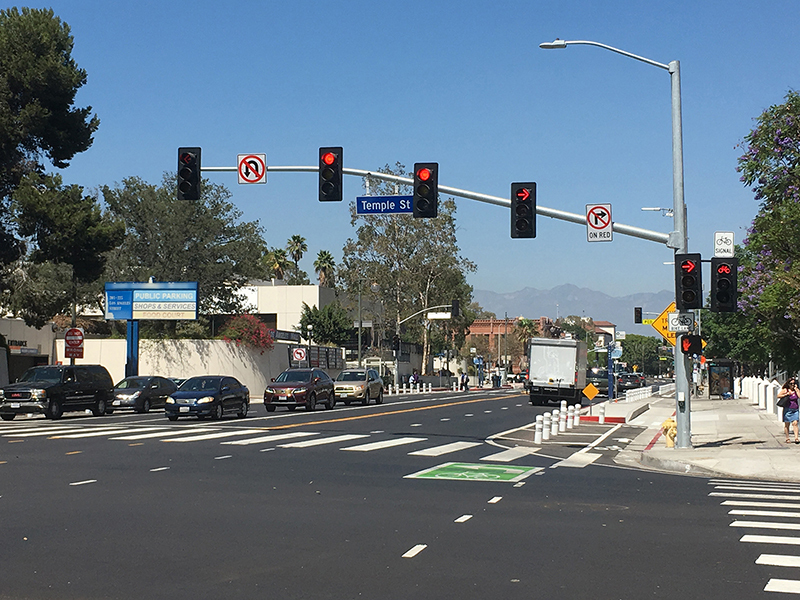 Read about a Transportation Pooled Fund study on Traffic Signal Systems Operations and Management. See the AASHTO Innovation Initiative Web page on ATSPMs. View live signal performance metrics case study sites for Las Vegas, NV; Seminole County, FL; and Utah. Contact Eddie Curtis or Rick Denney of the FHWA Resource Center for information and technical assistance. How can State Transportation Innovation Councils (STICs) lead the way in an era of rapid change? Transportation professionals explored elements of effective STICs at a workshop at the Transportation Research Board 96th Annual Meeting in January in Washington, DC. The workshop was sponsored by the Committee on Technology Transfer (ABG30) and the Committee on Conduct of Research (ABG10). STICs—which bring together stakeholders to identify and deploy innovations—operate in all 50 States, Washington, DC, Puerto Rico, the U.S. Virgin Islands, and Federal Lands Highway. FHWA encouraged formation of the STIC network to create a strong culture of innovation in the transportation community and get innovations into practice quickly. “We’ve established a STIC network. Now we need to nurture it and leverage it to its max,” said Harman. The workshop focused on elements STICs need to develop an innovation culture in their States: origins of innovations, outreach and communication, telling a compelling story, and change management. After hearing presentations, participants broke into groups to discuss goals, challenges, and solutions to reinforce these elements in a STIC. CAI is compiling the groups’ recommendations and STIC best practices into a tool STICs can use to strengthen their efforts to lead change. In addition to working with external stakeholders through the Wisconsin STIC to consider innovations from the Every Day Counts (EDC) initiative and other sources, WisDOT formed an internal Innovation Review Committee to evaluate ideas. Committee members represent a range of agency functions, including traffic operations, project development, and information technology. Esse then assembled local innovation teams in WisDOT regions to draw frontline staff into the innovation process. Jan Huzvar, Pennsylvania Department of Transportation (PennDOT) deputy communications director, discussed the importance of telling a compelling story about a STIC and the quantifiable benefits of the innovations it champions. This involves using outreach and communication strategies to build partnerships and share successes. Among the communication tools PennDOT uses to provide updates on STIC innovation efforts are its Web page, Innovation in Motion newsletter, and social media. Other useful STIC education tactics include infographics, videos, news releases, and events. “Have a communications person whose job it is to talk about your success because success breeds success,” Huzvar said. Ben Huot, Utah Department of Transportation preconstruction engineer, outlined change management principles agencies and STICs can adopt to focus their efforts to create a culture of innovation, such as fostering leadership trust throughout an organization and following through on innovation initiatives to maintain momentum. Huot also reviewed techniques STICs can use to implement change, including identifying the right champions to lead innovation efforts, sharing information through effective messages, using a risk-based approach to analyzing innovation, and developing good relationships with industry partners. 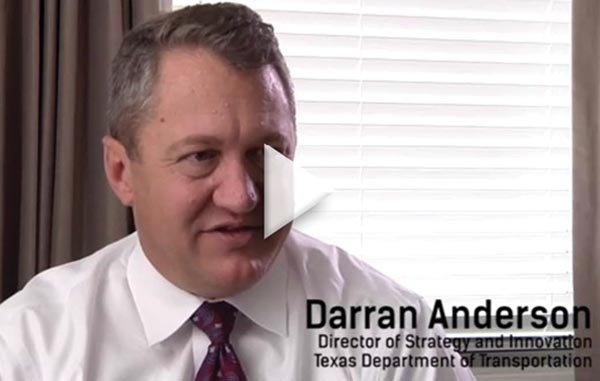 When the Texas Department of Transportation (TxDOT) formed its STIC in 2016, “we looked at our peers and took what we thought was the best from all of those programs,” said Sonya Badgley, TxDOT research project manager. The STIC’s primary purpose is to provide a forum for transportation leaders to review and collaborate on innovation efforts that align with Texas transportation goals. Sources the STIC uses to generate ideas include council members, TxDOT’s research program, the Texas Technology Task Force, and EDC. Among the strategies the STIC uses to encourage stakeholder involvement in this large State is offering member organizations the option to attend meetings by webcast or send alternate representatives. Users—like customers—are always right, so listen to them and understand their needs. Communicate why it’s essential to adopt an innovation. Expect resistance to change and show how an innovation can produce significant improvement. Foster innovation champions and encourage communication among peers. Keep innovation messages simple and clear. Establish, build, and leverage an innovation network. Tell a compelling story that quantifies success. Celebrate and learn from mistakes. In what may be a national first, the Virginia Department of Transportation (VDOT) signed a programmatic agreement with five Federal and State partners to streamline highway project reviews under Section 106 of the National Historic Preservation Act of 1966. The Federal Highway Administration, U.S. Army Corps of Engineers (USACE), Tennessee Valley Authority (TVA), Federal Advisory Council on Historic Preservation (ACHP), and State Historic Preservation Office (SHPO) joined VDOT in signing the August 2016 Section 106 agreement, which delegates decisionmaking responsibility to VDOT on projects with potential effects on historic properties. “We believe our programmatic agreement is the first of its kind where multiple Federal action agencies have agreed to the Section 106 review procedures and have delegated major decisionmaking to a State DOT,” said John Simkins, Planning and Environment Team leader in FHWA’s Virginia Division. Programmatic agreements, part of the first and second rounds of Every Day Counts, establish streamlined approaches for handling routine environmental requirements on common project types to increase efficiency while saving time and resources. Virginia’s Section 106 agreement covers all VDOT projects that require FHWA, USACE, or TVA action. The agreement simplifies the environmental review process because instead of Federal agencies needing to demonstrate Section 106 compliance separately, compliance is accomplished all at one time. Besides FHWA, the most common agency that needs to act on road projects is the USACE, which must issue permits for projects affecting waterways. Virginia’s agreement also includes the TVA, which must issue permits on some projects in the southwestern part of the State. The Virginia agreement includes procedures to expedite the Section 106 review process for emergency situations and minor projects not affecting historic properties. It also defines a process to update Virginia’s historic bridge inventory. 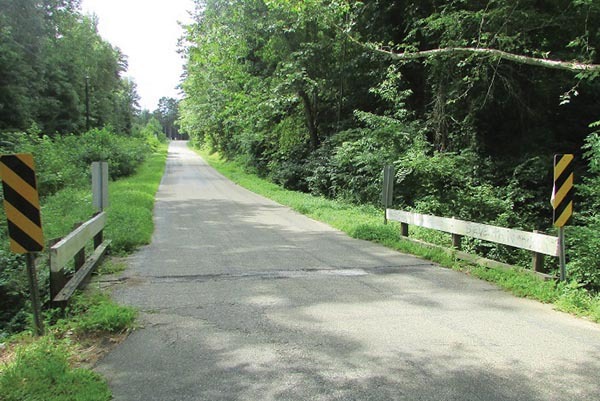 “Most of the projects it covers are Federal-Aid actions with FHWA, but there are many hundreds of smaller, State-funded maintenance projects requiring permits from the U.S. Army Corps of Engineers that have benefited from its efficiencies,” said Antony Opperman, VDOT Cultural Resource Program manager. As part of the agreement, VDOT posts a monthly list of minor projects it has determined will not affect historic properties. Safe driving in adverse conditions—whether rain, fog, or darkness—requires visible road markings. Retroreflective pavement markings that bounce light from vehicle headlights back to drivers’ eyes improve safety and prevent roadway departure crashes, but they must be maintained to ensure they remain visible over time. Some highway agencies rely on fixed repainting schedules, while others measure retroreflectivity with handheld or mobile measurement systems to determine when pavement markings need to be repainted. 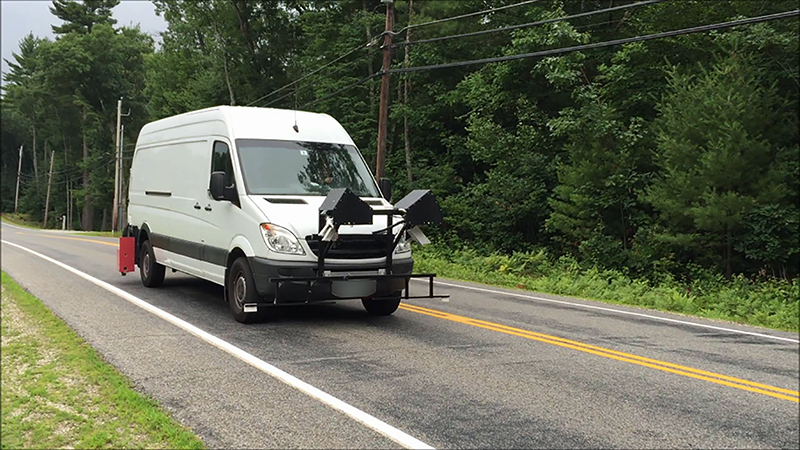 A grant from the Federal Highway Administration Technology Partnerships program enabled Leetron Vision LLC of Concord, NH, to refine its prototype Mobile Retroreflectivity Unit (MRU) to improve its ability to handle various road and environmental conditions and collaborate with the Florida Department of Transportation to conduct field tests. A Technology Partnerships grant helped refine a mobile measurement system agencies can use to determine when pavement markings need a new coat of paint. Credit: Leetron Vision LLC. The MRU uses real-time laser tracking technology to measure pavement marking reflectivity at highway speeds. A new FHWA report, Advanced Methods for Mobile Retroreflectivity Measurement on Paving Marking, explains the technology, outlines steps taken to refine the Leetron unit, and discusses results of tests using the system to collect pavement marking data. The Technology Partnerships program, part of the Highway for LIFE program to accelerate innovation use in transportation, provided grants to private industry to further develop proven, late-stage prototypes and evaluate them in real-world settings. The Leetron system uses a method of tracking measurements in real time that mitigates the effects of vehicle motion and variance in the road profile, one of the most challenging aspects of mobile retroreflectivity measurement. Using variable geometry technology, the system aims a laser at the center of the pavement marking and uses a feedback loop to readjust the aim point as the vehicle equipped with the unit travels at highway speeds. The system offers a faster measurement method than traditional systems by allowing simultaneous measurement of markings in two lanes. It also has an automatic calibration capability that minimizes downtime and maximizes data collection. An independent evaluation conducted by the Texas A&M Transportation Institute confirmed that the Leetron system can collect accurate retroreflectivity data on a range of paving marking types under a variety of challenging conditions. The evaluation included controlled testing in a laboratory and on an airfield runway along with field testing on open roads. “The results of the comprehensive testing demonstrate Leetron Vision’s MRU using variable geometry technology is capable of accurately measuring pavement marking retroreflectivty under a broad range of real-world conditions,” the report said. The Delaware Department of Transportation opened the State’s first diverging diamond interchange at Delaware Routes 1 and 72 in New Castle County. The agency used the design-build delivery method on the project, which received Accelerated Innovation Deployment (AID) Demonstration funding. Using the diverging diamond interchange design may have reduced construction time and costs by 75 percent compared to traditional alternatives. The Minnesota Department of Transportation (MnDOT) deployed a variable downstream speed notification system on an I-94 pavement project in St. Paul and Maplewood during the 2016 construction season. The system—one of the smarter work zone technology strategies recommended in EDC round three—notifies drivers of downstream traffic speeds to better manage speeds and reduce crashes when work zone congestion develops. MnDOT plans to use the system again in 2017. Using accelerated bridge construction saved months of construction time on a project to replace the Ochoco Creek Bridge in Prineville, OR. The existing bridge was removed and the new bridge—constructed next to the old bridge—was moved into place with slide-in bridge construction during a 3-week closure. Using conventional construction would have required closing the bridge for more than 3 months. 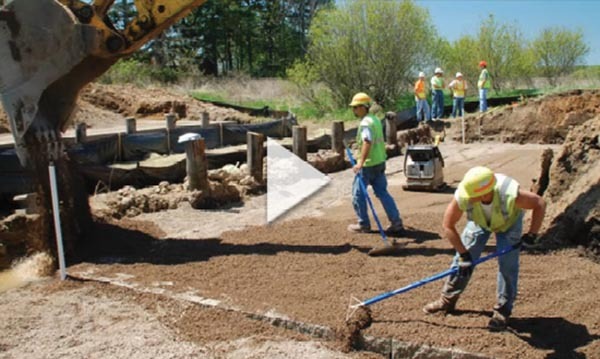 A time-lapse video from the Wisconsin Department of Transportation (WisDOT) demonstrates the use of geosynthetic reinforced soil-integrated bridge system (GRS-IBS) technology to replace a bridge on County Highway S over Shaw Brook in Dodge County. WisDOT and Dodge County received AID Demonstration funding for two GRS-IBS projects, the first use of the technology on a local highway in the State.